Keep Calm. It is only a first draft. This. Yeah, that quote right up there pretty much sums up my writing anxiety perfectly. 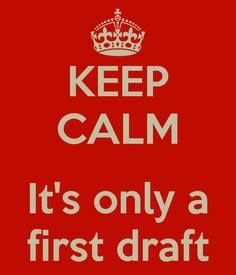 I want my first draft to be my last/ only draft. Yes, I know that is unrealistic; yet, my mind still thinks these silly things. Just like my brain tells my hand to write He instead of She or Wold instead of Would (-.-). Maybe I’m giving my hand some unneeded anxiety issues? This entry was posted on January 5, 2016, in Uncategorized. Bookmark the permalink. ← What do Writer’s Read?